The two hung out at Soho House in Hollywood. The 21-year-old Keeping Up With the Kardashians star and cosmetics mogul, who is on track to become the youngest self-made billionaire, wore a white, ruched Magda Butrym tefe off-the-shoulder mini dress with turkey and ostrich feathers, which retails for $2,120, paired with beige satin strappy pumps and a gold purse. She wore her blond hair in a ponytail. Jenner's dress brought to mind the white, off-the-shoulder Vivienne Westwood dress that her sister Kim Kardashian sported at the 2017 Met Gala. Jenner later posted on her Instagram page several photos of herself modeling her dress. "The drama," she captioned one of them. Woods wore a long, black, semi-sheer spaghetti strap dress, paired with peeptoe pumps and a red purse. She also showcased her new front teeth; she had had her famous gap closed. A day earlier, Jenner and Woods attended the reality star's Travis Scott's Astroworld tour concert in Los Angeles, wearing a pinstripe blazer dress and Nike sneakers. 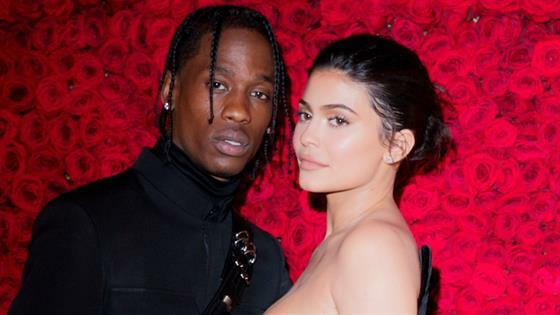 "We'll get married soon," Scott, who shares baby girl Stormi Webster with Jenner, told Rolling Stone in a recent interview. "I just gotta sturdy up—I gotta propose in a fire way."